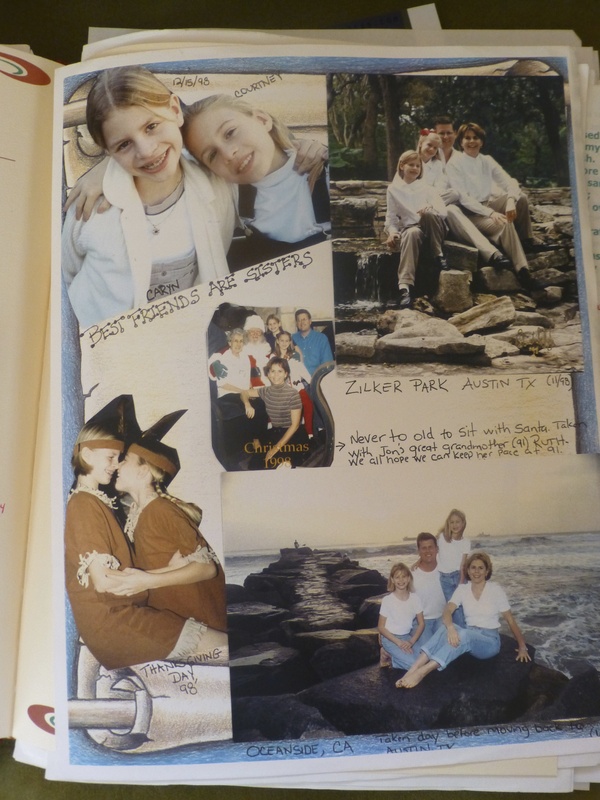 Our 1998 Christmas update in photos. We were living in California at the time. 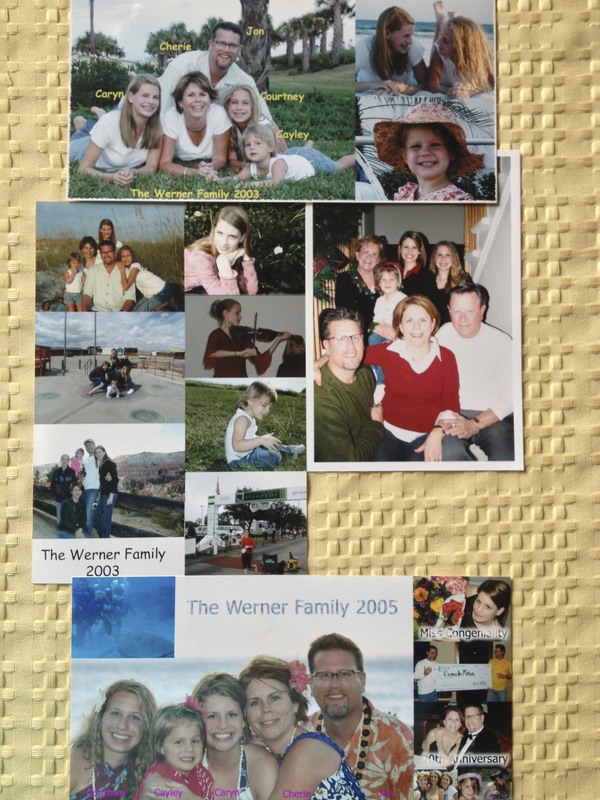 Staying in touch with family and friends really does mean so much thus one of our favorite traditions during Christmas is writing and sending out a family newsletter along with an updated photo. We began doing this shortly after having our first child. Much has changed since we started this tradition thanks to the affordability of home computers, printers, and personal blogs. 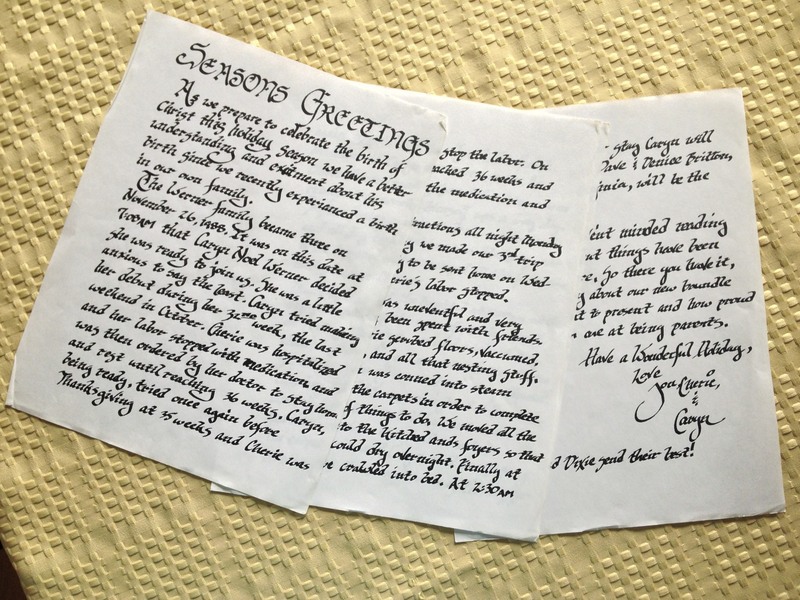 Our first Christmas letter was handwritten (see below photo). 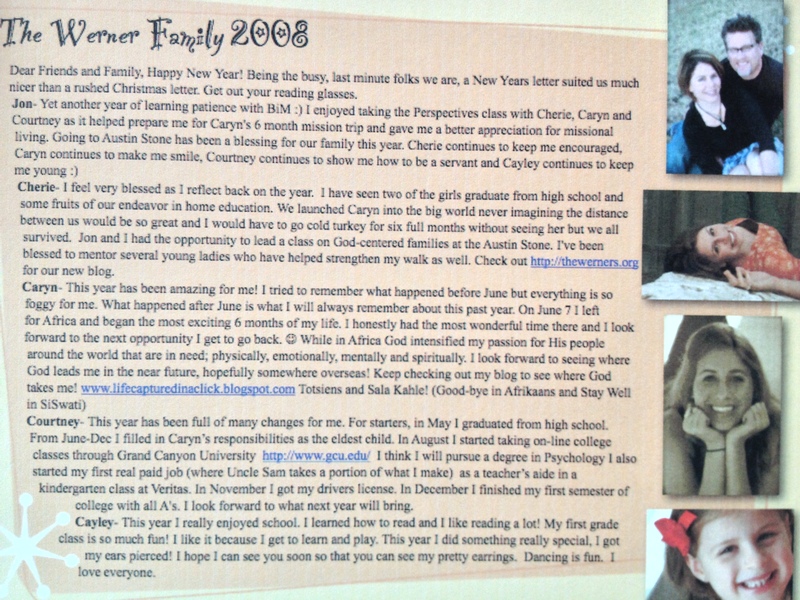 Last year I was able to post our update on my blog but I still had to mail it. Our purpose in sending out a yearly update is to share with family and friends God’s faithfulness to our family. Jon always adds a humorous touch as well. When the girls began their updates it added a different dynamic. Having moved thirteen times in our 27 years of marriage has given us the opportunity to accumulate friends near and far whom we try to keep up with. Updates are a little more personal than signing a card or sending an email. I don’t know about you but there is a special kind of happiness I experience when I walk to the mailbox and find a personal letter. Just the other day my eldest daughter sent me a handwritten note saying she was counting down the days till she was home. Her note lifted my spirits and made my day. The thoughtful note Caryn sent me. Notice it’s nothing fancy or expensive. However, it’s the thought that counts and she took time to comunicate with me. I relish receiving updates from friends and family. Pictures included often decorate our refrigerator. Sadly, because of social media, busyness, and the expense, many people no longer send cards, updates or photos. 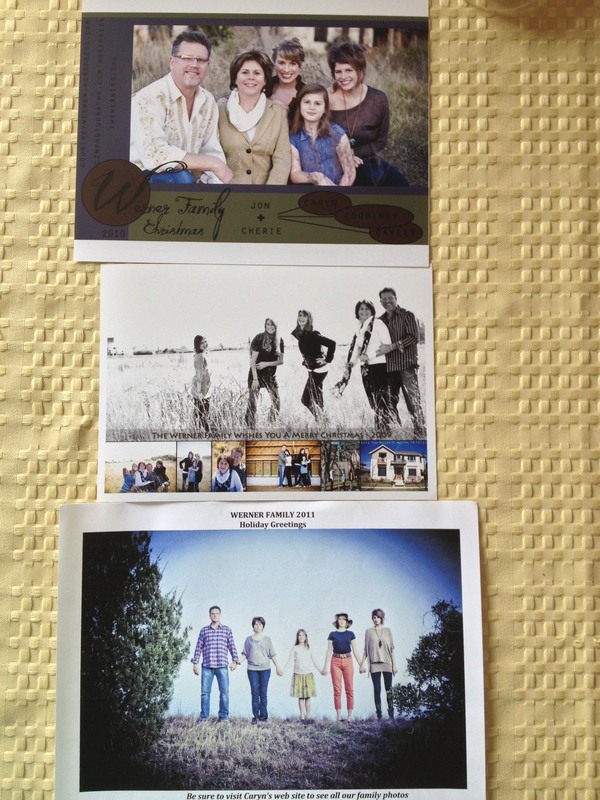 It doesn’t seem like Christmas when we are unable to get around to taking a family photo and chronicling our year. I know we will be lucky to get ours out by New Years this year because we want to include a family photo and the girls get home next week. Regardless of when it goes out we will have communicated with family and friends that they are thought of and we will add to our journal. 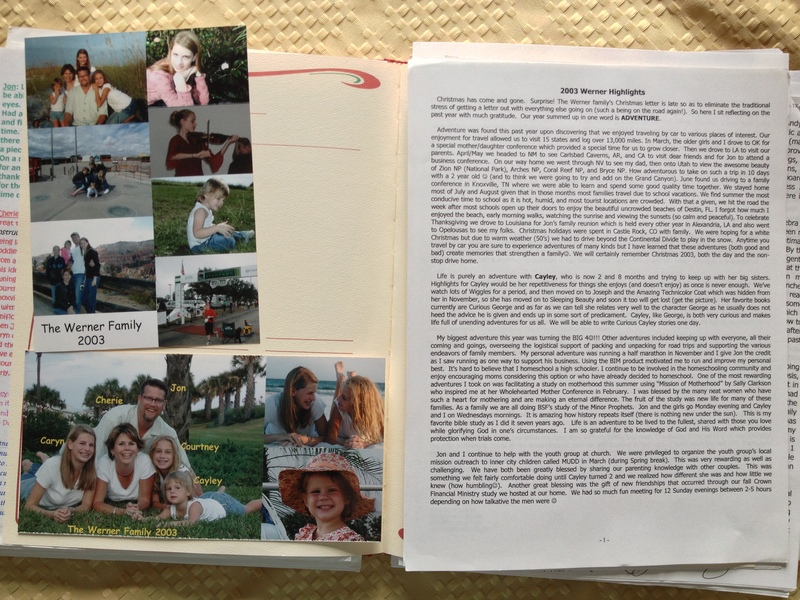 An unexpected memory that has come out of our diligence in sending out a yearly family update and photo is being able to go back and review the previous years. One day I look forward to sharing our journal with son in laws and grandchildren who desire to hear what their moms did for Christmases past. 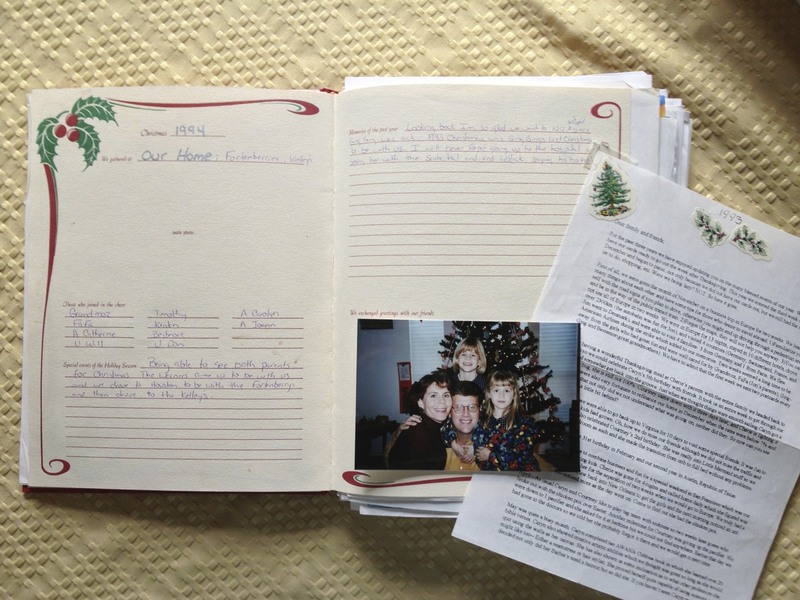 I found a Christmas journal where I currently keep all of our updates and photos. Sadly, this is the last year for the book therefore I will look for a cute scrapbook of sorts to continue our tradition. 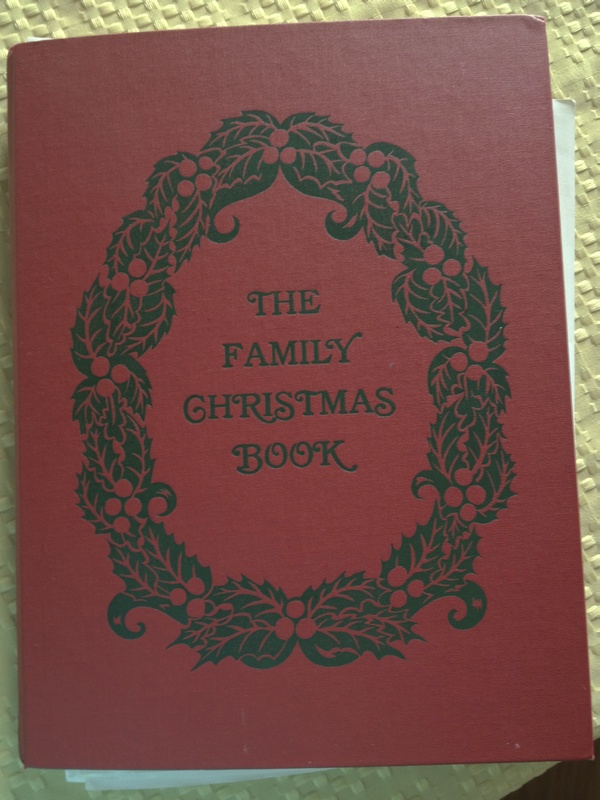 If you are interested in creating a yearly Christmas journal I’d suggest using a binder or scrapbook so you can add to it and place your photos and letters in sheet protectors. This will allow little hands to easily flip through the pages and it will stay in order. It’s fun to go back and reminisce over years gone by and be reminded just how blessed we have been. 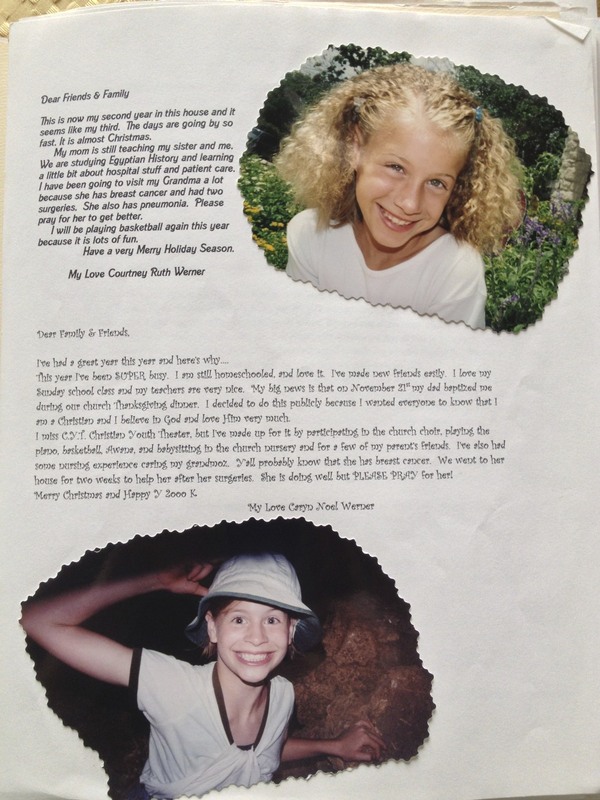 2000 update written by Caryn and Courtney. Notice that each year we recorded where we spent Christmas day, with whom, and special events of the year. Our tradition begins in 1988 before having a home computer or printer. 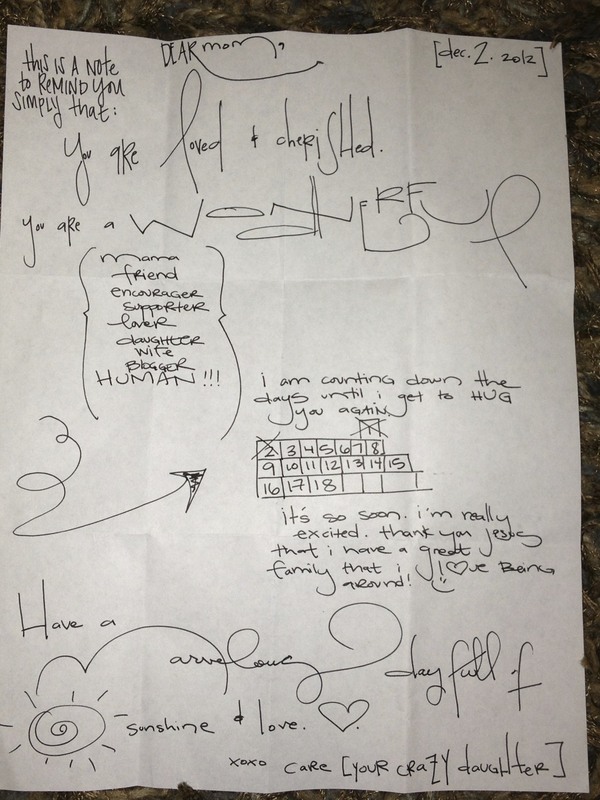 Notice the beautiful calligraphy by Jon. 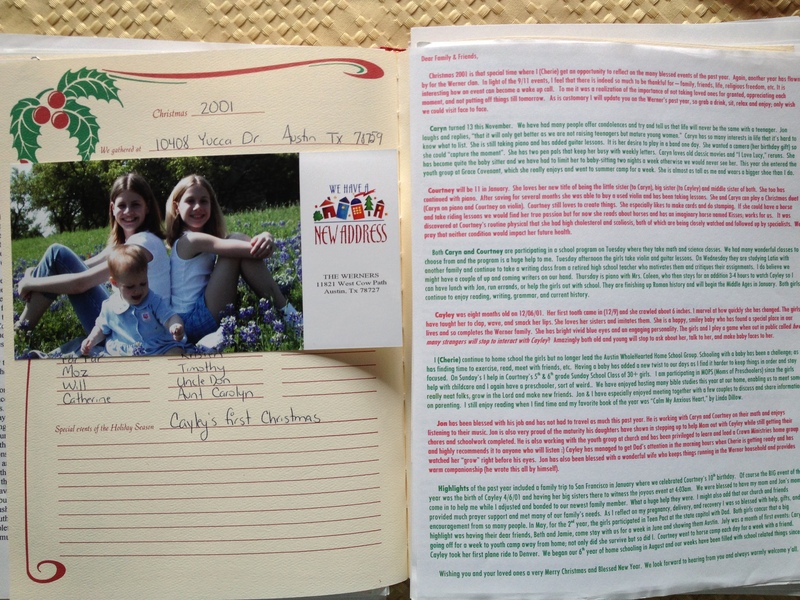 This is the Christmas Journal we have used for the past 20 years. The thought note Caryn sent me. Notice it nothing fancy or expensive. However it’s the thought that counts and she took time to comunicate with me. Cayley and some of her friends worshiping. Cayley is playing the guitar. May you too prepare to worship the King this Christmas season. Blessings. Our Advent wreath with the first purple candle lite. 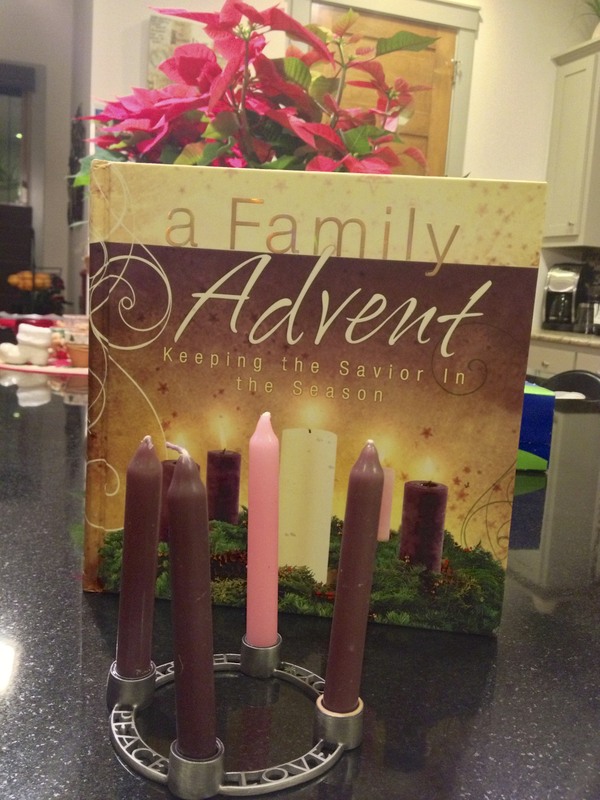 One of our family traditions during December is reading an Advent devotion together as a family. I enjoy Advent as it is a time to slow down the busyness of the day during the Christmas holiday and refocus my attention on the meaning of the “CHRIST”mas season. Advent comes from the Latin adventus and means “coming.” It’s a time to prepare to celebrate the birth of Jesus, while at the same time eagerly looking forward to His coming return. The symbolism of the Advent wreath is beautiful. The wreath is made of various evergreens forming a never-ending circle, signifying continuous life. The wreath is attributed to Martin Luther. 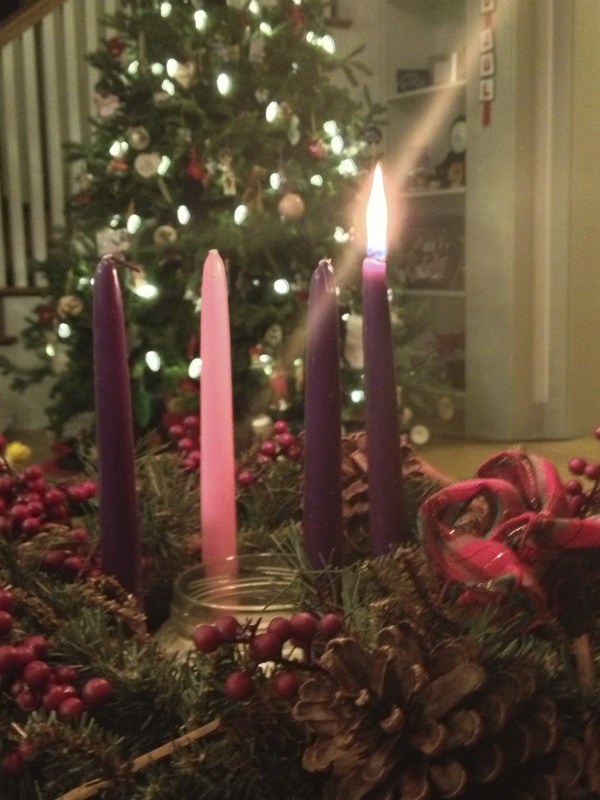 Four candles (three purple and one pink/rose) are placed on the wreath, representing the four Sundays of Advent. A fifth white candle is placed in the center of the wreath. Advent’s 1st Sunday symbolizes go HOPE and the first purple candle is known as the http://cinziamazzamakeup.com/?x=comprare-viagra-generico-25-mg-pagamento-online-a-Verona PROPHECY candle. Advent’s 2nd Sunday symbolizes cheap generic aripiprazole 10 mg online FAITH and the second purple candle is the pfizer viagra for sale BETHLEHEM candle. On the second Sunday light two purple candles, both of which are relit each night. Advent’s 4th Sunday symbolizes http://planb.ba/?search=viagra-online-usa PEACE and last purple candle is the http://millsys.co.uk/?search=silver-nitrate-drugs-and-viagra ANGEL candle. All four candles are lit each night during the week to symbolize the growing brightness of Jesus’ coming as He is the light of the world. Christmas Eve and Day concludes the Advent season by lighting all four candles plus the white center candle which symbolizes PURITY and is the CHRIST candle. The white candle reminds us that Jesus is the sinless, spotless Lamb of God, sent to wash away our sins! His birth was for his death; his death was for our birth! NOTE: The candle symbolism , order, and names differ among many. The four weeks of Advent, beginning the Sunday nearest November though midnight Christmas Eve. The weeks represent the four great “comings” of Christ. The first is His coming in the flesh, His birth, which we celebrate on Christmas Day. The second is His coming into the hearts of all who believe in Him. The third is His coming at the hour of death to the faithful, and the fourth is His coming at the final judgment. I find myself enjoying this family tradition more each year as I reflect on the rich symbolisms, the fulfilled prophecies, and the names of my Messiah. Advent is so much more than a tradition as it is a time of spiritual cleansing and growth in Christ. There are so many great Advent resources available and it doesn’t matter what you use so long as it works for your family. This year we are using Bartholomew’s Passage by Arnold Ytreeide, Adornments by Family Life Today, and A Family Advent, Keeping the Savior in the Season. Jon has been in Portland this week but faithfully he has Skyped us to read Bartholomew’s Passage. Cayley and I are reading this devotion together during school. Notice the miniature advent holder I found for my girls, it’s so cute. 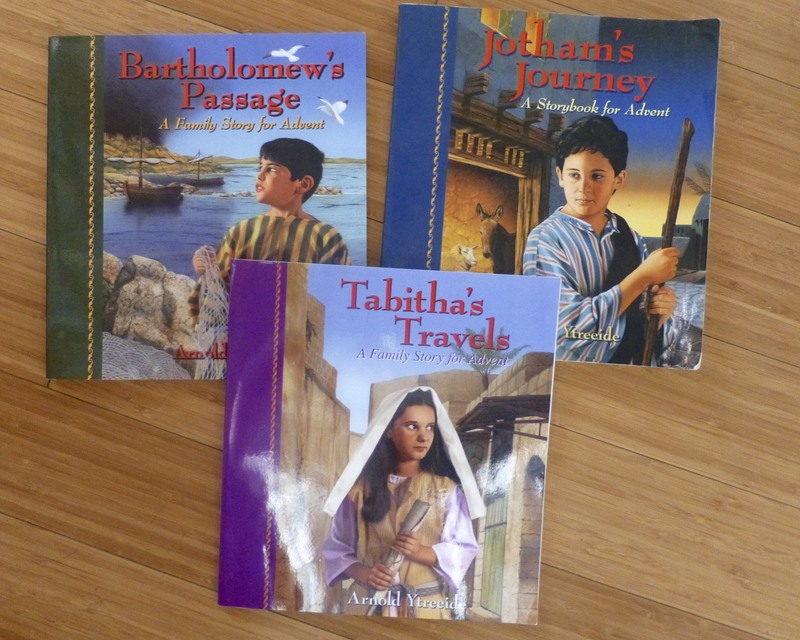 These Advent books hold the attention of children 8+ and each evening ends with a cliff hanger having the children asking for more. We truly have enjoyed these books for the past eight years and alternate them. These picture ornaments tell the names of Christ. The ones hanging are Lamb of God and Good Shepherd. 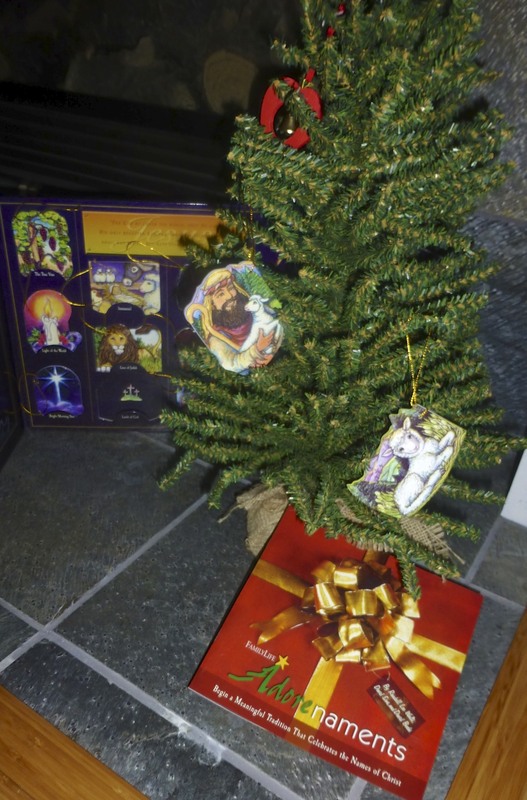 There is a scripture reference and devotion for each ornament. Best of all they are durable and non breakable for small hands. Why the different colored Candles? Purple has traditionally been the primary color of Advent, symbolizing prayer, repentance, preparing, and fasting. Purple is also the color of royalty, demonstrating the anticipation and reception of the coming King celebrated during Advent. Pink or rose is one of the colors of Advent used during the third Sunday. Pink represents joy or rejoicing and reveals a shift in the season away from repentance and toward celebration. Indeed incredible joy awaits us with the arrival of the Christ chile. White is the color at the center, representing purity. Christ is the sinless, spotless, pure Savior. Also, those who receive Christ as Savior are washed of their sins and made whiter than snow. This season I hope you and your family will draw closer to Christ as He loves you so much. He came humbly as a child and died to give you life. My hope is that by understanding what Advent is and the rich symbolism behind it your heart will experience the magic of Christmas anew. May an Advent tradition helps us not lose sight of the true meaning of Christmas. Jesus is the reason for the Season. Blessings.